The cathepsin family is comprised of several proteolytic enzymes stored in cellular organelles called lysosomes. A key cellular pathway involving lysosomes is autophagy, the process of cellular self-digestion, where cathepsins hydrolyze and degrade cytoplasmic proteins, bulk cytoplasm, and dysfunctional organelles for recycling. Fig. 1. 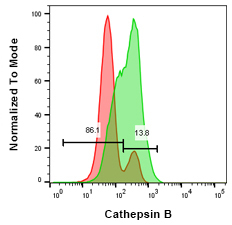 Intracellular cathepsin K activity detected in THP-1 cells using Magic Red Cathepsin K Kit (ICT939). Cathepsins also play a role in phagocytosis and upon release from lysosomes into the cytoplasm, they can initiate or regulate apoptosis through both the extrinsic and intrinsic pathways by different mechanisms. Increased levels of cathepsin activity have been linked to diseases such as cancer, arthritis, and Alzheimer’s, indicating that cathepsin proteins may be a potential target for novel therapies. Fig. 2. Cathepsin B staining in Jurkat T cells after inhibitor treatment. Jurkat cells were treated with 10 μM CA-074 Me (red histogram) or were untreated (green histogram). Cells were then stained using Green Cathepsin B Kit (ICT9152) and analyzed by flow cytometry using a ZE5 Cell Analyzer. 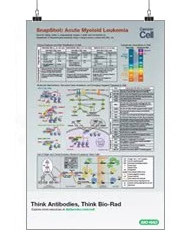 Bio-Rad’s Cathepsin Detection Kits, available in green or red fluorescence, allow analysis of active cathepsins in whole, live cells. Their methodology utilizes a substrate-based assay with a rhodamine 110 or a cresyl violet fluorophore probe. Both probes are non-fluorescent when bound through amide links to two target peptides. Active cathepsins can cleave the target peptide at an amide link which causes the rhodamine or mono cresyl violet fluorophores to emit fluorescence. Rhodamine 110 emits at 525 nm, when excited at 500 nm, and can be detected using microscopy or flow cytometry using the 488 nm laser and a 525/35 nm filter. Cresyl violet emits at 610 nm when excited at 540-590 nm. Uncleaved target peptides have excitation and emission wavelengths of 592 nm and 628 nm, respectively, resulting in minimal cellular auto-fluorescence. Fig. 3. Lysosomes stained with acridine orange in normal Jurkat cells. The photostable substrates for cathepsin B: (z-arginine-arginine)2, cathepsin K: (z-leucine-arginine)2 and cathepsin L: (z-phenylalanine-arginine)2 easily cross the plasma membrane and intracellular organelle membranes of living cells. Cathepsin activity can be determined by the accumulation of fluorescence when hydrolysis occurs within organelles. An increase in cathepsin activity results in a greater fluorescent signal. Cellular analysis may be performed with a flow cytometer, fluorescence microscope, or plate reader depending on the kit. 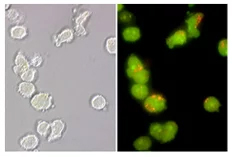 All the Bio-Rad kits contain a Hoechst stain for labeling nuclei and the Magic Red Kits contain acridine orange for lysosome and organelle identification.